This post is inspired by a trend that was running on Twitter. It gave me an idea for a post, and this is a shout-out to all the guys reading this. None of these are meant to put you down or make you feel like you're not trying/doing this already. If you are, thank you. If you aren't, this is a challenge. You are male by nature, but a man by choice. Treat me as you would want guys to treat your sister. You should respect me because you respect yourself. 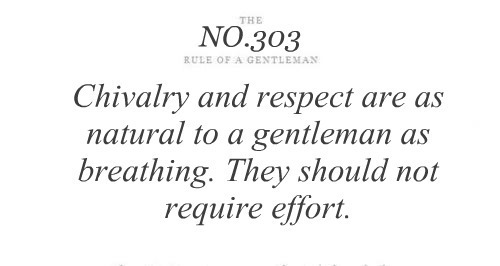 Don't call yourself a 'gentleman' if you aren't prepared to back up your words and act like one. We love it when you take the effort to ask how our day has been. Asking a girl out over text is tacky and cheap. If you respect a woman even if she isn't a lady, that makes you more of a gentleman. Just holding the door open for me will make my respect for you go up a notch. Be the kind of man you would approve your daughters of marrying. Even the smallest act of kindness really does not go unnoticed by us. Chivalry never die; some of you just choose to ignore it. All guys should read this. I love this, Raquel :) Hey . . . maybe you would think about asking one of your "From a Guy's Viewpoint" guys to do a "Dear Girls" guest post? Good post. It is sad how rare gentlemen are these days, my Dad taught me it was normal to be a gentleman, it should be normal, but just how rare we've become is evident when I hold the door for a woman at the Post Office, the looks I get, they just seem so astonished they I, a young guy would do something like that for them. I hope more men read this and take note. "Keep Calm and be a Gentleman."